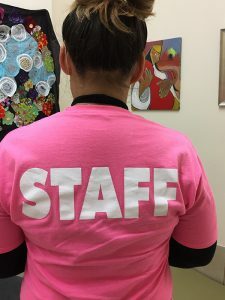 Across the back of her bright pink ICS tee-shirt is the word “STAFF”. It’s written in bold capital letters. And, the letters’ boldness is a reflection of Rebecca McCusker’s personality and sense of self. The letters also replace difficulties that Rebecca has carried on her back. “I’m an open book,” Rebecca said. “I’m a survivor of everything, not just homelessness. I’ve been addicted to methamphetamines. I’ve been a victim of domestic abuse. I’ve suffered great loss including the death of my baby.” Like most of the people seeking help at the Interfaith Community Shelter, it’s not just one adversity that has brought them there. Rebecca came to ICS about two years ago when she needed to leave an abusive partner and she lost her apartment. She volunteered for over a year and a half before being hired at the Shelter about six months ago. She reports in at ICS for her job on the janitorial maintenance staff. It’s different than other jobs Rebecca has had, but she’s earned her place. “This is the best job I’ve had because I can help others – I love helping people!” Rebecca exclaimed. With this job and the help from ICS and Life Link, Rebecca can now afford an apartment with her new fiancé. When asked complete the sentence: For me, Interfaith Community Shelter has ______, Rebecca replied, “The Shelter has helped me grow as a person. It got me where I am today. 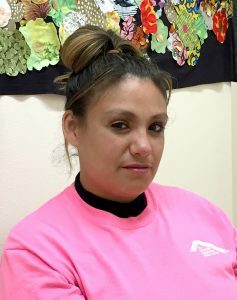 With the help of the people here at Pete’s Place including Life Link, I’ve learned to work past the hurt.” She added, “I’ve survived because I feel the support and trust here.” She also credits the support of other guests at ICS with being able to work past the hurt and not remember it. With Rebecca’s willingness to share and help others, she is sure to be part of their peer support, too.